New ambience for your hotel, restaurant and café. A hotel guest or restaurant guest does not go there because only wants to stay overnight or eat. Today's guests expect a direct wow effect, they want to be baffled, to experience something different. The composition of furnishings, furniture, dishes / porcelain, drinking glasses and, of course, the decoration both inside and outside play a very important role. Of course, the components already mentioned provide the right atmosphere - furniture, colors, fabrics, decoration .... That's why it pays to check these elements regularly, not just from the perspective of functionality, but also from the perspective of optics. Because the guests want to feel comfortable all around. Only then will they consume, stay longer, come back and ... recommend your address! The clever buyers among you do not save on the quality - because the procurement of goods has a huge impact on the success of your business. Glass, glassware and table decoration. 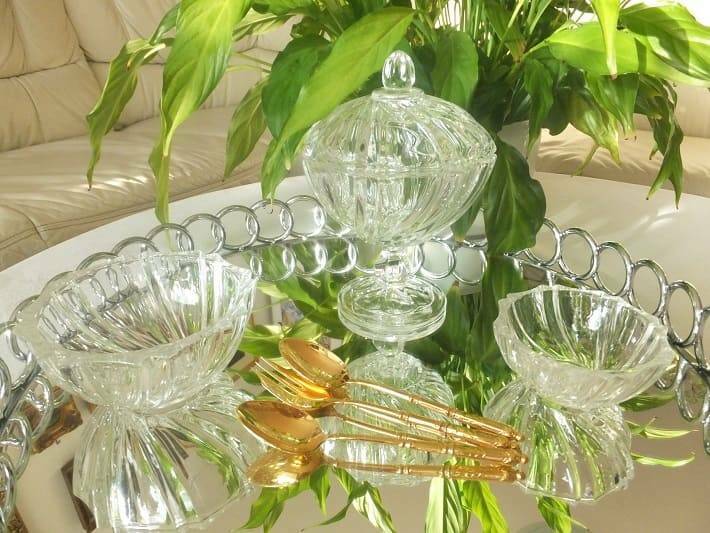 This unique collection, which consists of various elements, gives you the opportunity to redesign your table decoration - it does not matter which parts you just put together - the bowl with plate or the goblet on the plate. The perfect combination allows you to repurpose the table every time. For your wellness or spa area, the imposing glass goblets with or without lids are just as perfect. The individual pieces are made of heavy glass and are therefore very stable and difficult to tilt. If it is up to the guests, it may be a little more in the hotel cosmetics - but without too much waste and foil of the mini - packaging. Less is not more! The imposing chalices are truly perfect for that. Glass trays with artistic motives. Do you still serve your guests the special creations of the house - ice cream, drink, coffee, champagne on the usual gastronomic trays? How about some creativity with WOW effect? For example, an elegant ice cream bowl on the glass tray with Gustav Klimt motif, espresso from the glass cup on the mini tray with Adele Bloch Bauer illustration .... Your guest can then buy the beautiful pieces directly from you (at the bar or reception)! The exquisite pieces are in the elegant gift boxes and can be easily transported.